Reliability – The robust design of the VISIONS 3000 produces a system which is able to run efficiently and reliably, 24/7. The VISIONS 3000 is the cost effective Hot Runner Temperature Control System. Low Cost of Ownership – Reasonable Cost, Longevity, Reliability, Usability, Advanced Features, Upgradable. Usability – Intuitive, easy to use & understand. Reliability – Visions 3000 are manufactured for Industrial Environments. Usable Features – Visions 3000 suite of operational & diagnostic features are second to none and intuitively easy to use. Accurate Control – Adaptive Thermal Control provides accuracy, energy savings, precise monitoring & protection. Maintainability – VISIONS 3000 is designed so everything is easily viewable & accessible. Technology – As updates become available they are backward compatible for a 10 year period. The VISIONS 3000 Linux Rev. 2.52 has enhanced the algorithm within the Adaptive Thermal Control to fine tune the most troublesome of molds. Under normal operations it is carried out during the warm up process, individually tuning each heater to control within 0.5° F of set point. This is done by delivering smooth and exact power to each heater in increments which provide the smallest actual temperature deviation. For troublesome tools, the operator has the ability to select from 5 different settings which can precisely fine tune the P.I.D. operation to match the mold. Because of their different mass and operating characteristics, Manifolds & Nozzles zones are provided with their own unique set of algorithms. By controlling Manifolds & Nozzles independently, smooth and efficient control is possible. A significant difference between the VISIONS 3000 and other systems is that we control power. It is realized that all hot runner systems control power, but with the VISIONS 3000 the primary emphasis is on power. It is power that produces heat and any temperature rise in the tool is a result of power being applied. Only with the proper control of power can temperature be controlled accurately. To understand what is happening in the tool, we need to know what the power is doing. Proper balancing of power reduces reduce electrically generated noise. The VISIONS 3000 switches power to the load as the voltage crosses zero. In addition, the VISIONS 3000 also balances the power output by spreading the “ON” cycles over a 1 second time period. For example, a 50% output power on other systems consists of half a second with power “ON” and a half second with power “OFF’. With the VISIONS 3000, the power is “ON” on for a half a cycle and “OFF” for half a cycle. As can be seen from the graph below, this produces a considerably smoother power delivery, reducing oscillation of the heater, while increasing reliability and increasing the accuracy and stability of the control loop. Balanced Power Output reduces the overall current consumed by the mold, therein reducing energy consumption and cutting cost. Using a combination of a fast, efficient tuning algorithm and a balanced power output to the heater, almost any heater is capable of being controlled to within 1 degree. The uses has the ability to define the start-up sequence of the manifold heaters. 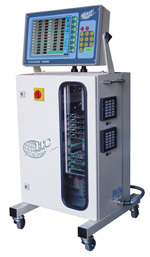 This is useful for molds with a large number of heaters that exceed the maximum current available if they are all ramped together and provides the means to program the specific start-up recommendations of the hot runner manufacturer, automatically balancing the hot runner during the critical warm up phase and allowing bushings to seat into the mold better, reducing material leakage. This feature has a trigger temperature that once the manifold zones reach this trigger temperature, power starts to be applied to the Cavity zones to achieve production temperature in the shortest period of time. Power limit settings can be applied to both the Manifold and Cavity zones. These limits prevent full power from being applied to the heaters, a particular problem with small wattage bushing heaters where 100% power can increase the internal core temperature of the element 100’s of degrees above the temperature actually being measured. This reduction in maximum power applied also reduces the overall power being applied to the tool, preventing current consumption exceeding supply limits. Manual Soft Start – Sometimes referred to as Bake Out, this manually triggered, 30 minute. Low-power function removes moisture in the mold. 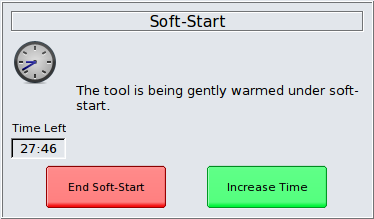 Automatic Soft Start – When the RUN function is selected, the power of all the zones are ramped from zero. Due to their increased thermal mass, the ramp rate of the Manifold zones is greater than the Cavity zones. Ramping power has significant advantages to ramping temperature – most noticeable, any thermocouple fault condition that prevents temperature increase in a zone does not prevent the complete tool from reaching production temperature. Manifold Pre-Heat – It is widely recognized that heating the manifold zones before the cavity zones allows the bushings to bed into the mold preventing leakage. The Manifold Pre-Heat option enables the operator to select this function, if required, and by permitting the operator to select the trigger temperature at which the cavity zones start ramping, warm up time is kept to a minimum compared to systems that require the manifolds to reach temperature before activating the cavity zones. In today’s world of ever increasing energy costs, efficiency is a major concern. ATC (Adaptive Thermal Control) adapts power usage to the precise thermal requirements of the tool, balancing the power demand to reduce temperature oscillation in the heater, thus increasing control accuracy whilst also increasing the reliability of the heater. This offers the user the most energy efficient method of controlling temperature. Additionally not to exceed power values can be selected for any or all zones. Because of the differences in mass and operation of Manifolds and Cavities the VISIONS 3000 provides PID algorithms tailored to meet there specific requirements. By controlling Manifolds and Cavities independently, smooth, efficient and even control of the mold results. For exceptional mold heater requirements, manual settings of the tuning parameters are available. The dialog box to the left is displayed whenever the GLOBAL hot key is pressed when the VISIONS 3000 system is in RUN MODE. Permits the global editing of the Setpoint, for a selectable range of zones, this can be done for several different ranges of zones, if different increments of increase or decrease are warranted. This function automatically puts the selected zones into automatic/closed loop mode.Permits the editing of Output Power to the heater for a range of zones in a manner similar to editing of the Setpoint temperature. This function will automatically put the selected zones into manual/open loop mode. Permits the linking of the output from a series of selected zones to the input thermocouple sensor from a different zone within the system. A temporary rise in temperature normally used to clear a cold slug on start up. Boost operates on Cavity zones only. 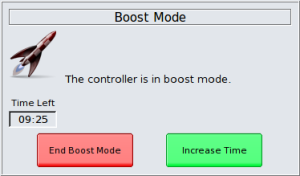 The increase in temperature (or power if the zone is in manual mode) and the time that Boost is applies are both operator settable. This function can be saved on the tool database. Stand-by lowers the temperature of Manifolds and Nozzles to a safe range when the molding system is at idle. This process can be manual or automatic. If connected to sensors on the molding press and feedback indicates the molding operation has ceased for a period of time, VISIONS 3000 can place itself in stand-by mode, lowering the temperature to a safe range thereby preventing the degrading of plastic and saving energy. Standby operates until cancelled. This process can be saved in the tool database. The tool diagnostic function is a very important facility. In this regard the VISIONS 3000 incorporate a suite of functions especially designed to troubleshoot the mold both at start-up and during normal operations. The VISIONS 3000 applies a measured amount of power to each zone in turn for a period of 1 minute. Within this time the response in measured and the results shown on the screen. Note; the level of power applied to manifold zones is larger because of their larger thermal mass. Swapped heater or thermocouple wires. If one is found, the controller indicates the affected zone. Heater Power Monitoring & Alarm (Amperage & Wattage) – High/Low limits set to monitor heater operation & detect possible material leakage in the manifold or disruption in the cooling system. Heater Resistance Monitoring & Alarm – helps predict in advance when a heater is about to fail. Thermocouple Open, Reversed Thermocouple, Cold Thermocouple, Open Fuse, Open Heater, Shorted Heater, Etc. When initiated on a new or reconditioned tool, a full suite of diagnostic tests automatically perform functional analysis on all aspects of the tool and controller, on a zone by zone basis, providing information on any errors which may exist. The results can be stored and downloaded, providing a historical baseline for comparison checks and providing a record of tool history. The VISIONS 3000 Monitor Mode permits the operator full access to all the Setup and edit modes whilee seeing the effect on-screen with live thermocouple readings, but with NO power being applied to the tool. This is particularly beneficial with new tools that appear to have no errors on the tool room bench, but exhibit unusual behaviour in the press. During normal operation, the VISIONS 3000 constantly monitor all elements to determine functionally of the tool. When the VISIONS 3000 senses a wiring or heating problem an alarm will activate with a description of the error, which is saved to the History Log. When a signal is provided from the molding machine indicating activity, the VISIONS 3000 activates a countdown clock. If another signal is not received in the selected time frame, the VISIONS 3000 can be automatically placed in stand-by mode. Selectable failures in the Hot Runner or WaterFlo operations can trigger an alarm which will shut down the molding operation stopping damage. It is clear from looking at the VISIONS 3000 that our common sense engineering approach has produced a rugged, compact, no-nonsense system, which is designed and manufactured to stand-up to the rigors of the harsh industrial environment and operate day-in & day-out for years to come. Components are of industrial grade, i.e. The touchscreen is rugged enough to stand up to a harsh blow from, for example, an individual’s fist. The cabinet is constructed of heavy gage steel, and with a stable low center of gravity. The VISIONS 3000 employs a buss bar concept which, which means fewer connection points to fail. Through every step of the design process ITC has kept a careful eye towards maintainability. To this end the VISIONS 3000 incorporates LED’s that are visible through the front panel which indicate operation of all output & processing cards as well as fuses. Cards & fuses can be replaced by simply opening the front panel, pulling the card from its slot and inserting a new one, with little or no interruption of production. The compact size of the VISIONS 3000 allows the system to fit into tight spaces. For example our 64-zone system is only 24” wide by 18” deep by 49” high. 12 months of fully downloadable production history, alarm logs & graphs. Both hot runner & WaterFlo data is automatically stored for a period of 12 months, this becoming an invaluable management resource for today’s intensive quality and production requirements. Individual heater power usage & temperature during the production cycle on a second by second basis. All user and set-point changes made during production. Tool diagnostic reports and set-up files. All data is time & date stamped, allowing for searches by time & date. All History Event logs are viewable from the VISIONS 3000 controller and are downloadable. All data is viewable from the VISIONS 3000 controller screen or downloadable to a PC or Laptop. Set up data is transferable between VISIONS 3000 controllers. Data cannot be deleted by the user and is password protected. The VISIONS 3000 system is capable of storing all tool operational settings for well in excess of 100 different & unique molds, all but eliminating the need to re-enter set-up data. 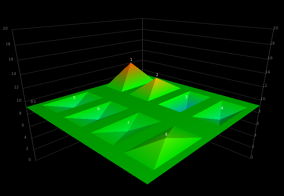 The value of every selectable parameter for each zone within the mold. All zone modes and their associated values, i.e. whether the zone is turned off, linked to another, in manual or automatic modes and the value of each. Settings are downloadable & transferable to any other VISIONS 3000 systems. Each Cavity heaters power consumption is constantly and individually monitored. Any increase in power demand is the first sign of a developing problem and early detection is vital in preventing avoidable scrap and tool down time of the machine. It is bad practice to turn off unused zones in any mold; this will create cold spots which can affect the balance and flow of material within the manifold system. Its’ much better to enter a low temperature that keeps the tool balanced, in a manner which won’t produce defective parts in any zone. The minimum set point option allows the supervisor to enter the minimum acceptable temperature, normally around 240°F (depending on the type of material). This will prevent the operator from turning the unused zones off, in its place they will have to enter a temperature instead of turning them off. All data can be downloaded via USB to PC or Laptop for back up and viewing. The data can be viewed as a text file, spread sheet or in graph format, allowing for easy distribution of information. Real time off site monitoring and ITC monitoring can be implemented via Ethernet/Wi-Fi facility. External triggering of: Run, Stop, Standby. External triggering of Production Halt, Referred to as “Motion Standby”, and this feature automatically puts the VISIONS 3000 into standby mode when an “in production” signal fails. This prevents degradation of material and reduces power consumption. Internal “Tool at Temperature” signal. This feature can be used to prevent production of the mold before the tool is at temperature, thus preventing short shots and tool damage. Industrial Grade Color Touch Screen on the VISIONS 3000 Rev. 2.52 has maximizes the potential of this interface to fully utilize all the benefits and advantages of touch screen technology. Like previous VISIONS 3000 systems we utilize 4mm safety glass screen so the unit integrity is not compromised. The top box (operator interface) can be removed from the lower box (controller) and conveniently mounted near the molding machine operator. Uncomplicated, straightforward menu of features equates to the easiest to understand & operate system available. Start-up is easy – just enter the set-points and let it run. Tool Database provides for convenient saving set-up and operation of in excess of 100 tool sets. This information is transferable to other VISIONS 3000 systems. The remote operator interface means the display can be located near the operator. Operational overview is as easy as calling up the Surface Graphs Feature, in a matter of seconds any individual can determine which if any zone or zones have any variation from baseline. Control operation and fuse conditions are indicated by LED’s visible through the front panel. Cards can be replaced by simply opening the front panel, pulling the offending card from its slot and inserting a new one, with little or no interruption. The Multi-lingual function of the VISIONS 3000 allows true international adaptability. A number of common languages are included as standard, including, Spanish, Mexican, French, Danish, German with others easily added. All screens and functions are conveniently presented in a logical manner on a large (12”) high brightness, color touchscreen. 1Selectable screen modes allow users to select between increased information for each zone or higher number of zones visible on the screen for each page. The VISIONS 3000 Real Time Water Flow & Temperature Monitoring Option with Warning Alarms & 12 months of Historical Records. The Optional Smart Manifold & WaterFlo Interface is an extremely accurate (1.5% full range) Mold Water Flow Monitoring System, with the ability to Monitor, Measure, Graph & Log 12 months of Flow Rate & Temperature Data for all mold water cooling channels. Additionally A warning signal can be generated to activate an external warning device, or even disable connected equipment. 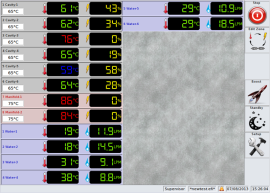 WaterFlo functions are integrated to display with hot runner zones. ITC’s Precise Water Flow Monitoring is Critical for any molding operation requiring Elevated Quality, Traceability, Production Efficiency, and Reduction in Maintenance Cost. All Data is edited and viewable via the VISIONS 3000 controller. Flow sensors are precisely installed in the ITC Smart Manifold with an interface module added to the VISIONS 3000 control. Any critical drop in the water flow rate will trigger a safety response from the VISIONS 3000 controller. If setup, power can be cut to the tools heaters, a machine stop trigger activated and machine alarm activated. No water, no power! The water data will also show trend changes and gradual flow reduction which is particularly useful for maintenance to monitor the condition of the water filters. Multi-channel water mapping of the tool provides significant information with production and maintenance benefits. All water data and alarm activations are recorded in the downloadable data and graphs history database. The WaterFlo option required the addition of an ITC Smart Manifold & Interface Unit. By continually monitoring the heater, the system can be set to alarm when wattage consumption falls out of a historical baseline, thereby alerting to potential material leakage into the manifold system. 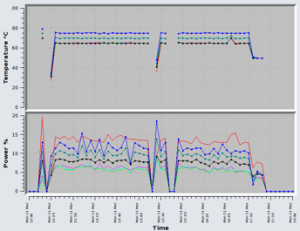 This is done by monitoring the most recent information and comparing it against a recorded baseline thereby helping the user predict in advance, a potential heater failure and avoiding expensive downtime. There are various alarm triggering events within the VISIONS 3000 System, allowing management to make intelligent operational decisions, such as allowing the system to continue operation, placing the tool in standby, audible or visual alarms and/or to shut down the tool. 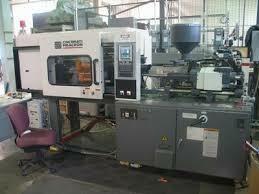 This allows management the ability to determine a strategy for the molding operation. 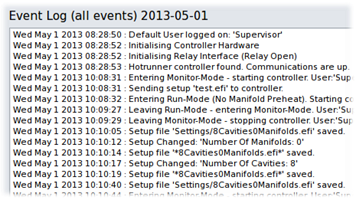 Alarm initiations are saved in the Event Log for 12 months. Each alarm trigger, for example thermocouple faults, can be assigned a level and each level can be assigned an action, for example place the controller into standby mode. An alarm strategy can be established on a per mold basis and stored in the tool Database for future recall. Ignore – No action taken. Alarm – The controller toggles the Alarm relay, which if connected will sound the external machine alarm, start the alarm indicator lamp and stop the machine. 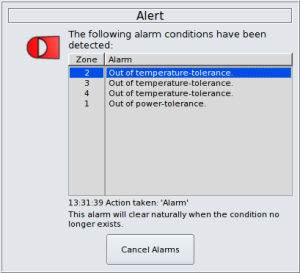 The controller continues to maintain temperatures and the Alarm Warning Dialog is placed on the screen. Standby – All zones are placed into standby mode, the Alarm Relay is toggled and the Alarm Warning Dialog is placed on the screen. 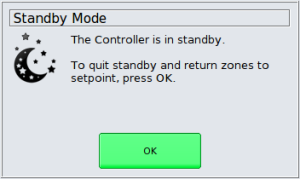 Shutdown – The controller turns all zones off, the Alarm Relay is toggled and the Alarm Warning Dialog is placed on the screen. Water Zones if fitted have their own set of Alarms. Open Thermocouple – No action taken. Reversed Thermocouple – The temperature readings from the zone are incorrect. Cold Thermocouple – The temperature readings from the zone are incorrectly lower than the actual temperature. Temperature Tolerance – The zone’s temperature has drifted beyond a set amount from the setpoint. Power Tolerance (cavities only) – The zone’s heater is drawing more (or less) than a set amount of power than the average power drawn by the cavities. Tool Motion – Controllers fitted with a machine interface can detect when the tool is moving. This alarm can be set to trigger when a minimum number of movements is not detected. Detection of stopper production. This is achieved by the monitoring of the Motion Standby output from the machine to the input on the rear of the VISIONS 3000 top box. Either a simple identification of a failed signal can be detected, or a number of production cycles can be detected. Display of a time countdown during which it is possible for production to be re-started. Parameters can be set that will either shut the system down or place it into Standby. Note: Monitoring of the Motion Standby input does not begin until all the zones are at temperature and the real time clock has changed from yellow to green. It is possible to monitor the state of the Motion Standby input by the border color of the real time clock. When there is “NO” Motion Standby input, the real time clock border will be the same grey as the rest of the bottom border. If there is a Motion Standby input, the real time clock border will change to a dark grey. Provide immediate at-a-glance insight into the operation of all zones on the tool by means of easy to read 3-dimensional & trend graphs. Provides immediate at-a-glance insight into the operation of all zones on the tool by means of an easy to understand 3-Dimensional graph. Peaks and Valleys point out those zones which deviate from baseline. A much faster method of determining out of tolerance conditions than other methods such as tabulated data. A time line has been added to enable production history to be searched for by specific time and dates during the previous 12 months. Trend Graphs: A scalable display of the historic values for selected zones, showing both the measured temperature and power values for up to 8 zones. In this way, problematic zones can be identified, something that can’t be done using historical analysis of only measured value. 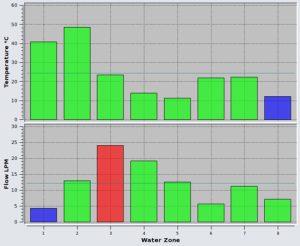 WaterFlo function has been added to the suite of graphs, providing detailed analysis of both flow rate and temperature. A time line has been added to enable production history to be searched for by specific time and dates during the previous 12 months. Typical systems are normally under 128 zones, but the VISIONS 3000 can control tools having up to 256 zones. Each zone is normally rated 16 amps at 240vac. Low voltage zones can be supplied for compatibility with, for example, Plasthing. Seiki Spear, Etc. Zones without thermocouple feedback can be linked to a zone with similar operating characteristics which has a thermocouple feedback. This function can be stored in the database. The VISIONS 3000 has three (3) levels of password protection. Only the functions allowed by each level are accessible and the system automatically resets back to the locked mode after a preset time interval. For world wide applications the VISIONS 3000 has multi-lingual capability. The following languages are built into the system: English, Spanish, Mexican, German, Danish, French & Italian. Other languages can be easily incorporated. The ease of use and maintenance philosophy of the VISIONS 3000 is carried over to calibration of the system. The input circuitry of the VISIONS 3000 has no potentiometers, removing any drift in the measurement of the thermocouple input. Parameters within the system enable an offset to be applied to easily calibrate the unit. Under normal circumstances, a calibration check would only be required once every year. Support & training is the philosophy behind the VISIONS 3000. As well as manuals being available for download free of charge from the website, the VISIONS 3000 is backed by a worldwide network of agents and distributors. For user convenience the VISIONS 3000 comes with three (3) viewing modes. Graph = Medium Density = Displays up to 18 zones per screen = Each zone displays the same information as Normal Mode, but two timeline graphs are added to each zone. The graphs show the last hour’s minute-average data for temperature and power. This data comes from the controller’s history database and is updated every minute. High Density = If there are more than 36 zones, you have the option to view up to 124 zones per page. Although there are more zones visible at once, the zone names and load display are not available. International Temperature Control, Inc. can provide VISIONS 3000 hot runner temperature control system to match most requirements. Allows for efficient balancing of a molds Hot Runner Zones & Mold Cooling Channels in one integrated system. The ITC Smart Manifold provides highly accurate water flow rate and temperature monitoring in a package with no moving parts with sensors enclosed within the manifold for protection. Note: ITC Smart Manifold & Interface Unit required. For Valve Gate applications, software built into the VISIONS 3000 as standard enable the operator to set a timing graph for the sequencing of the gates. Note: Additional hardware is required for operation of the valve-gate. However, this 2 output card (1 for valve open, 1 for valve shut) is a standard card and operates within the standard VISIONS 3000 rack, requiring no additional special hardware or software to operate. The parameters for this feature can be saved in the tool database. Standard cables & connectors are provided in a industry standard configuration. In those instances where the customer has different requirements, International Temperature Control, Inc. will provide the VISIONS 3000 with the exact type and style of connectors & cables required. The VISIONS 3000 can be up graded from its normal 15 amp zone capacity to 30 or more amps per zone. This requires the addition of solid state switching devices, heavier wiring, connectors and cabling. Total system load must be calculated to determine the requirements of the system. If 240vac input power is not available to run the VISIONS 3000, a transformer package can be provided to step down from 480vac to 240vac. Packages are provided on a portable stand with proper power interruption devices, etc. If the user’s requirements are for a system which can handle heater voltages of other than 240vac, the control system can be modified to accommodate.